Vietnam’s top security official has warned that “hostile forces” are out to topple the government, as four activists were sentenced to lengthy jail terms in one week. A doctor and influential blogger, Ho Van Hai, received a four year term for “conducting propaganda against the state”, at a brief trial on Thursday. Three pro-democracy campaigners were earlier jailed for six to eight years in a case that drew more attention on state media and internet forums. 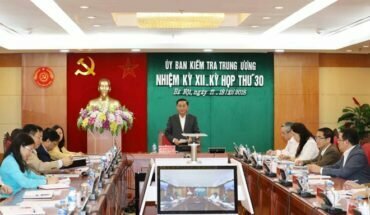 Hostile forces were developing many ways to destroy the leadership of the Communist party in Vietnam, said the Minister for Public Security, Lieutenant-General To Lam, in an article on the government website. He said the police were ready to fight and sacrifice to protect the party, adding that their sole objective was defending the “revolutionary government”. 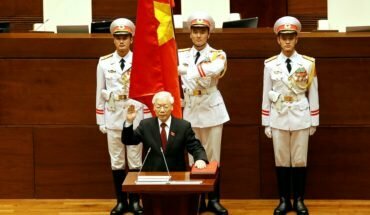 The comments reflect an earlier appeal by the Communist party leader, Nguyen Phu Trong, for the total loyalty of the police. The increased rhetoric about internal threats and subversion matches an escalating campaign to silence and imprison government critics, and the recent labelling of a second exile group in the United States as a terrorist organisation. 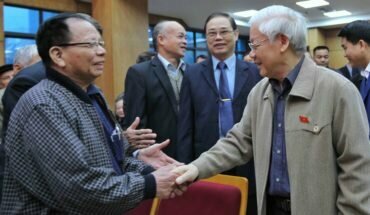 Mr Trong has put much emphasis on ideological rectitude, following years of emphasis on growth and development, since his reappointment as general-secretary of the party in January, 2016. The vigour of the campaign against those demanding more democratic freedoms suggests a degree of alarm amongst security hawks in the leadership. The old guard appears to have been blindsided by the explosive growth of social media and the party’s abrupt loss of its monopoly on information. Hai was held in detention for more than a year before his perfunctory and secretive trial on Thursday. There was no advance warning in state media, and Mr Hai’s relatives and supporters do not appear to have been alerted. He was particularly known for his writings on educational and environmental issues. He may have triggered a response from the authorities with his calls for action over the toxic waste leak that damaged fish stocks off the central coast in 2016, a highly sensitive issue for a government determined to stifle organised dissent. He was accused of “taking advantage of political events of importance” to vilify the country’s leaders.